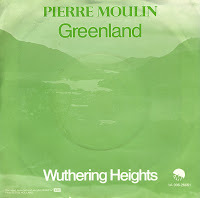 When you search for 'Pierre Moulin' on the web, the only relevant link is a site where this very single is for sale. I guess you can say that Pierre is not a very renowned musician. And when you hear these tracks, you know why: it's muzak at best. So why did I buy this single all those years ago? Well, the title of the B-side caught my eye. It's indeed a cover of the famous Kate Bush track. And since I am a fan of Kate Bush, I had to hear this track. (This was in the days when MP3's weren't freely available everywhere on the internet). I guess it is some sort of rarity, so another item I'm glad to own.